PVCpanels are one of the most comfortable materials when you finish. They can be used to cover the walls and ceiling in the room. In addition, they easily create an additional wall or built a small room inside another. 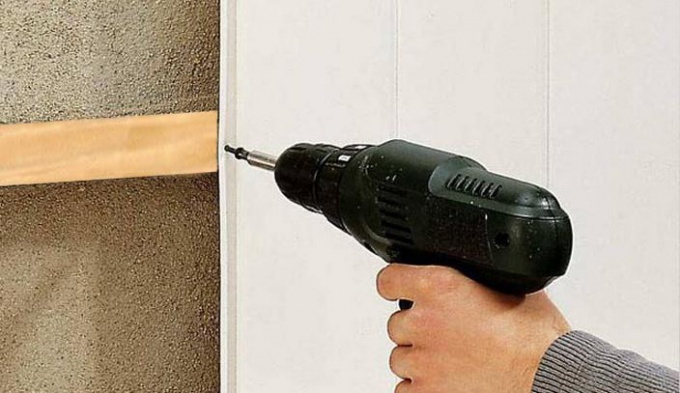 The most acceptable method of installation of PVC panels on a wooden frame. It is lightweight, and if I have to alter or remove built, it will not be difficult. Lay panel, PVC perhaps even alone. Determine the number of panels PVC need. To do this, measure the area where they will be installed. Take with a margin of about 10-15%. PVC panels can be mounted vertically and horizontally on smooth and not on the levelled surface. To install the panel on the wall, take the level and determine its curvature. To do this, attach it to the wall horizontally and mark the most protruding parts. Fabricate the frame, the most acceptable – from wooden bars. Their cross section depends on the communications that will take place over the PVC panels. Take a wooden block. Drill pre-drill holes with a diameter of 4-6 mm. Apply it on the protruding areas of the wall horizontally and mark through them for mounting dowels. Take a hole puncher and punch recesses pobeditovym a drill (6-8 mm). Insert the dowel. Take the bar into the drilled holes, insert the screws through the tree. Attach to the wall and fasten it by screwdriver or by hand with a screwdriver. Take a level or plumb. Note the wall mounting of the second bar. Secure it, if the wall is too big a gap, use the wooden substrate. Take a rule, metal profiles for fastening gypsum Board or smooth bar with a height of 2-2,2 m and attach to the two bolted bars. Better fasten them with screws to him. Take a third stick and set it on the level that will give a vertically mounted bracket. Screw to the wall horizontally a third beam in the same way as the previous one. Take starting profile for PVC panels and screw it vertically with screws (20-25 mm) to the edge of the received lattice (the short part should be on top). Also this need to be done around the perimeter of the site. Cut with a sharp knife the desired length of the panel and insert in the starting profiles (groove out). Fasten with screws or shoot her to the wooden lattice upholstery staples. Insert into the groove of the next panel PVC and also lock it. Enter them on the wall. Measure from the second width, including inside of a starting profile, cut along the panel and insert the last panel into the groove first, and then in the start-up profile by carefully prizing the upper part.